Don't ask. Don't tell. NC Cosplay repair team in "action." Nerds rule. 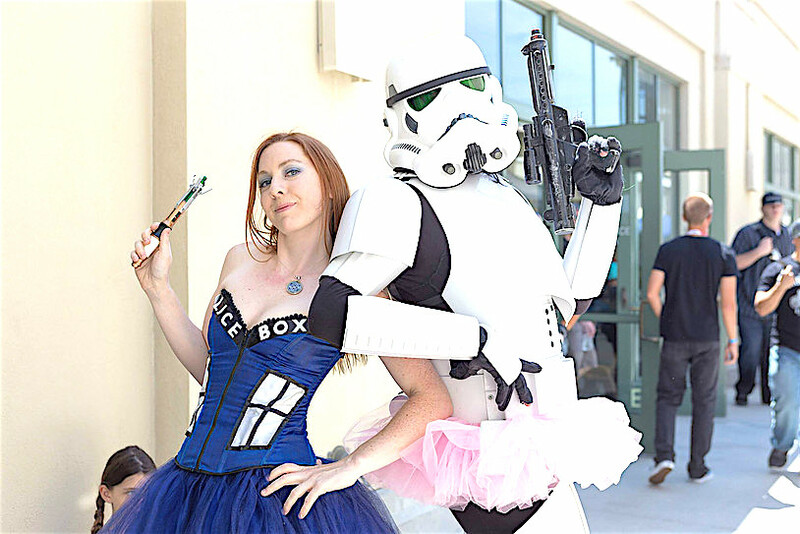 For three days, anyway, Aug. 26-28, at the California Center for the Arts, Escondido for the second annual Nerd Con. 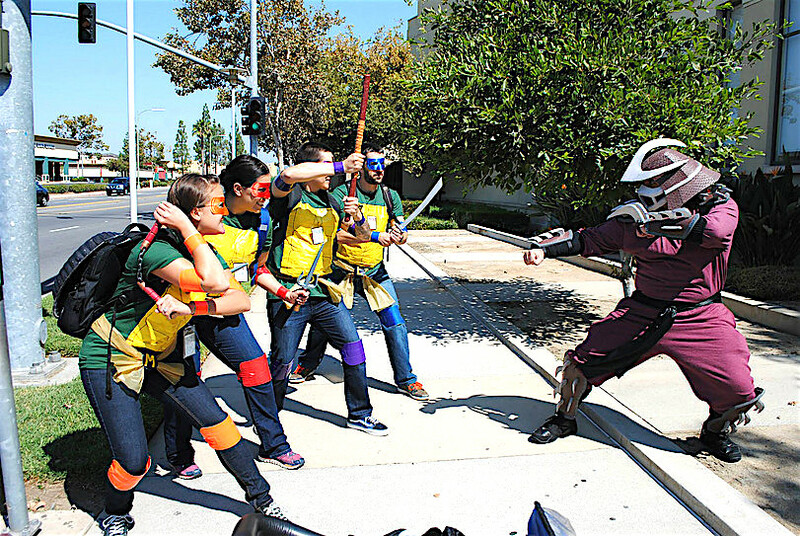 About 3,000 fans of comic books, sci-fi, cosplay, video games and anime came to the California Center for the Arts in Escondido for a one-day con of the nerds last year. That was then. this is now for the second year of the event that will span three days with a VIP party kick-off followed by two days of panels on all things nerdy. Thank Temecula homey Joel Jones, his girlfriend Trish Murphy, and her best buds Rachel Youch and Stephanie Pandes for the event, kind of a poor man’s version of Comicon. One of the challenges will be besting last year’s highly acclaimed event. “I almost teared up a bit, I was so happy,” Murphy said then. She and Jones met two years ago at Club Cosplay, appropriately enough, a Corona club designed for nerds who like to dress in costumes as they role play. The two love birds cooed about organizing their own event to fill the local pop culture void. Ergo Nerd Con. When is Nerd Con 2016? Nerd Con 2016 is being held on Friday August 26th (Badge Pickup Party 7pm – 10pm), Saturday August 27th and Sunday, August 28th, 2016. Show hours are: Saturday 11:00 am – 6:00 pm (10:00am for VIP PASS Holders) and Sunday 11:00 am – 5:00 pm (10:00am for VIP PASS Holders). How much are General Admission passes to Nerd Con 2016? Prices for Nerd Con 2016 will be $20 (passes are limited) for an adult Saturday only pass; $18 (passes are limited) for a Sunday only pass and $35 for an adult “2 DAY” pass and all “2 DAY” passes also include admission to the “Badge Pick up Party” on Friday August 26th, from 7pm-10pm. Children age 4 and under are admitted for free with an adult admission (limit of 1 per adult please) and must pick up “FREE CHILD PASS” at the registration area located in the Museum. Senior citizen (65 & older), military, police & fire fighter discounts are available (to request a discount code please send an email to nerdcon2016@gmail.com, with the subject line “Military/Police/Firefighter/Senior citizen Discount Code”) or have ID present at time of purchase at the door. How much are VIP passes to Nerd Con 2016? Prices for Nerd Con 2016 will be $50 (passes are limited) for an adult Saturday only pass; $40 (passes are limited) for a Sunday only pass. Included with ANY VIP PASS is entry to the onsite “VIP AFTERPARTY”(18+ Only) which will be held on Saturday, August 27th from 7pm-11pm. A VIP “2 DAY” pass is $85 for an adult “2 DAY” pass and includes admission to the “Badge Pick up Party” on Friday August 26th, from 7pm-10pm. Children age 4 and under are admitted for free with an adult admission (limit of 1 per adult please) and must pick up “FREE CHILD PASS” at the registration area located in the Museum. Senior citizen (65 & older), military, police & fire fighter discounts are available (to request a discount code please send an email to nerdcon2016@gmail.com, with the subject line “Military/Police/Firefighter/Senior citizen Discount Code”) or have ID present at time of purchase at the door. NC Ninja turtles vs. Shredder2 . Can I buy passes on-site at Nerd Con 2016? Yes as long as passes are not “Sold Out” prior to the event (in the event that any particular passes are sold out it will be made clearly known across all Nerd Con 2016 social media and on www.nerdcon2016.com), you can buy any available passes at the registration desk located inside the museum(starting on Friday Night August 26th (6pm-9pm), however we recommend purchasing your passes online prior to the event to ensure you will be able to purchase your pass (limited number of passes available). Day-of pass sales at the door will open at 11am on both full days(Sat & Sun). Pass pick-up & on-site sales are located in the museum! Beauty and the Beast, Nerd Con-style. I am a Professional interested in attending Nerd Con 2016. What do I need to do? All Professionals must register and be approved prior to the deadline(August 1st, 2016). We do not offer a +1 (guest option) – Professional badges are for individual professionals only. Where do I pick up my badge at Nerd Con 2016? And what about pre-registration? Can I pick up my badge at the “Badge Pick up party on Friday night on August 26th? Yes, ANYONE CAN PICK UP THEIR BADGE ON FRIDAY NIGHT or purchase a badge starting at 6pm until 9pm. However, you must have a “2 DAY” PASS in order to enter the “Badge Pick up Party” (you will be allowed to upgrade your pass to a “2 DAY PASS” at this time if there are “2 DAY PASSES” available at this time. Do I have to wear my badge at all times at Nerd Con 2016? To ensure the highest level of safety and security you MUST wear your badge at all times during Nerd Con 2016, and if you are spotted without a badge you may be asked to leave immediately. Security is very important to us to make sure you enjoy yourself at Nerd Con 2016 and there will be several clearly marked security guards and undercover security throughout the premises and inside each building at all times to ensure the highest level of safety during Nerd Con 2016. Can I take pictures at Nerd Con 2016? Photographs and Video are allowed at Nerd Con 2016 as long as you respect our privacy, terms and the wishes of those who DO NOT wish to be Filmed or Photographed (If you knowingly and willingly film or photograph someone against their will YOU MAY BE ASKED TO LEAVE IMMEDIATELY. Please be respectful of others and always ask before filming or photographing them. Parking is FREE and is also at your own risk, we do not accept any responsibility for any damage to your car (example: a tree branch falls and scratches your car, etc.). 1 Comment on "Nerd Con 2016 this way comes"
Thanks for having a con that you can actually get tickets for…enjoyed last year…I hope I will be attending the 50th anniversary one day too.